A picture from the public hearing in City Hall on Tuesday 18 September. Since 2011, the redevelopment of the Newcombe House site, as well as Notting Hill Gate as a whole, has been discussed in the Kensington Society’s newsletters, annual reports, alerts to members and at the AGMs. In addition, throughout the entire consultation with the previous site owners and then finally with the current developer, Brockton Capital, we have encouraged local residents’ associations, our own members and members of the local societies to attend the open consultations. 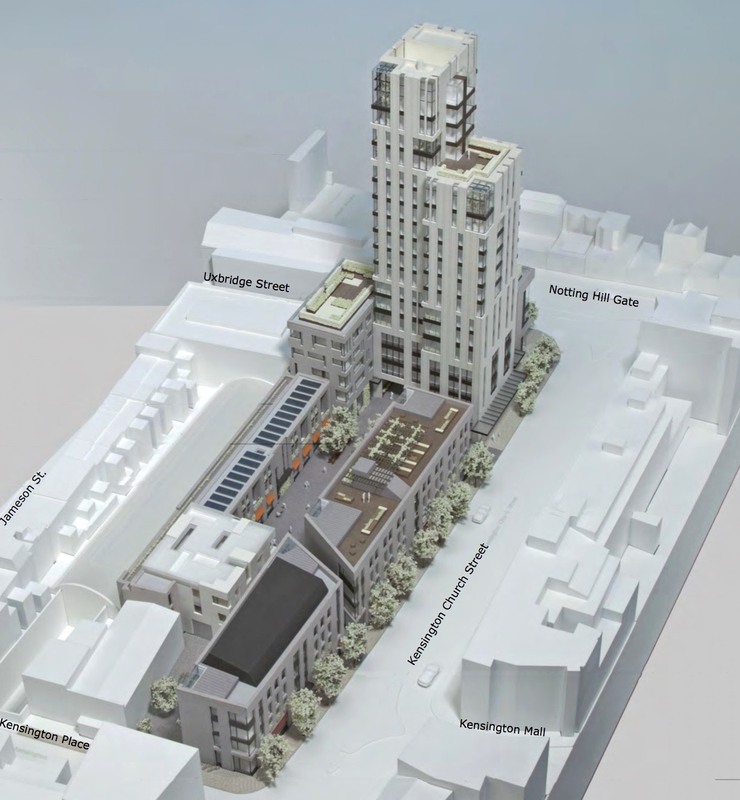 Ever since Brockton Capital presented the first Newcombe House application in 2015, the Kensington Society and the Ladbroke Association have supported this plan to reinvigorate the drab corner of Notting Hill Gate and Kensington Society. Three other resident associations also supported the scheme, until the campaign against it reached such levels of anger that they decided to pull back and take a neutral stance. We haven’t supported this because we like high-rises, on the contrary, but because we quickly realised that no developer would be able to develop that constrained site without building higher. How else would they be able to make the project financially viable? If they were to simply tear down the old buildings and build new ones at the same height, that cost, combined with the purchase price of the site, would result in such astronomical rents for the companies interested in occupying the offices and retail units, that hardly any would be able to afford to do so. Yes, while the debate about Newcombe House has focussed on the height and the housing, this project has first and foremost been about maintaining and improving Notting Hill’s stock of offices and retail units, as that creates local jobs. The project will deliver 8,355m² of offices, shops and restaurants, compared to 7,775m² today. This is in addition to the 9,339m² of housing (whereof 35% genuinely affordable), a large GP surgery for 18,000 residents, a large public square with farmers market on Saturdays, and step-free access to one of the Circle Line/District Line platforms (the other platforms are outside the reach of this development). Most of the benefits are the result of many hours of consultation with the local resident associations, where the developers genuinely listened to what amenities the locals wanted, on a level we have never experienced with any other developers. Mr Mayor, good afternoon and thank you for giving me an opportunity to speak in support of this planning application. My name is Peter Mishcon. I am here to represent the Kensington Society and the Ladbroke Association. I am a practising architect. I work in Kensington & Chelsea and I live about 300 metres from the site with a clear view every day of Newcombe House. 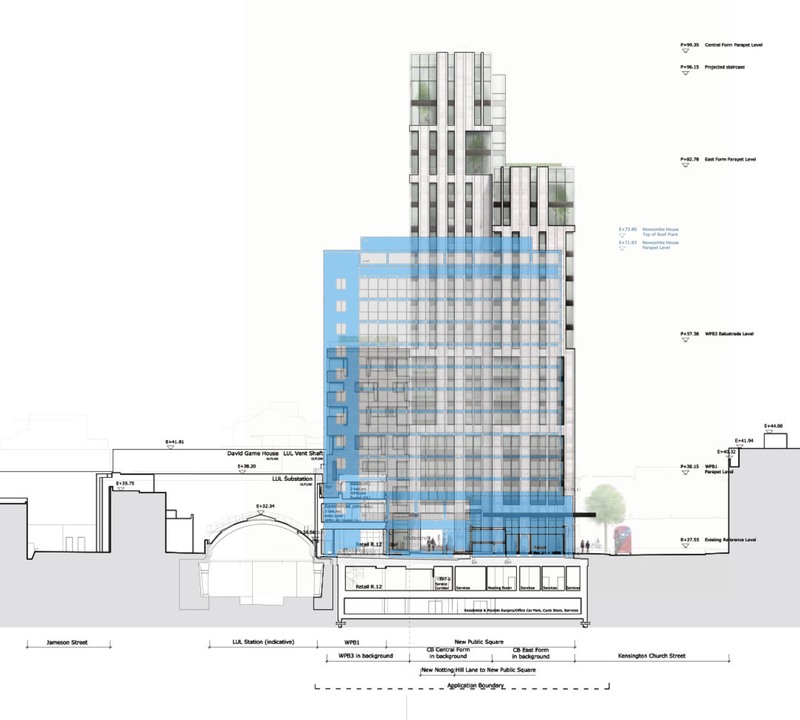 I am sure you’ll appreciate that the Kensington Society and the Ladbroke Association don’t often find themselves supporting high-rise schemes in Kensington, but we believe that there are strong arguments for an exception in this case. FIRST: This is a site with considerable physical and legal constraints that work against a lower tower with the bulk of the development spread more evenly across the site. Having worked through the limited alternatives, our view is that this proposal represents the best and least harmful way of providing the owners of the site with sufficient commercial and residential accommodation to finance the public benefits contained in this proposal. SECONDLY: We accept that architectural design, like all art forms, is highly subjective. However, the height of the tower, the quality of the architecture and the materials to be employed were all picked over in great detail by the Inspector at the 5-day public enquiry last year. The Inspector in his report was satisfied with those aspects. Having attended all 5 days, we too were satisfied with the rigour of his enquiry and his assessment. THIRDLY: Over a period of more than 10 years all of the community organisations affected by the development of this site have attempted to engage with previous site owners intent on its development – Land Securities, Delancey, The Retail Consortium and The Pears Group. In contrast to these former owners of the site, we would like to make the point that the developer promoting the proposals before you today has, from the beginning of their involvement with this site over 4 years ago, undertaken an unprecedented consultation process with local amenity groups and the public. They have been responsive to our suggestions and the consultation process has been directly instrumental in generating a number of improvements to the scheme. We are very well aware that this is a controversial scheme on which some of our members take differing views. But it is our carefully considered opinion that the very significant public benefits, which only this site can deliver in Notting Hill Gate, outweigh the disadvantages. Moreover, now that the concerns for the inclusion of additional on-site affordable housing have, in our view, been met in this new application, we are worried that, were this proposal again to be refused, the much-needed public benefits contained in these proposals may be permanently lost. So we ask you, Sir, not to allow a further drawn-out search for an impossible ‘best’ become the enemy of a well- designed, viable scheme. A scheme that, among other benefits, will bring much-needed market and affordable housing, state-of-the-art medical facilities and employment to the residents and users of this part of central London – every one a benefit to our area that the council itself is not in a position to provide. The Kensington Society and the Ladbroke Association would therefore ask that you grant consent for this application for this major site. Thank you. The main controversy around the new Newcombe House complex has been the height of the three buildings replacing the current Newcombe House. This drawing (looking north) very clearly shows the difference, with the current building superimposed in blue: The GP surgery building will be much lower, the corner building will be slightly higher, and the middle tower will be significantly higher. All pictures in this column are courtesy of Brockton Capital and U+I. A model of the site before the GPO surgery building was increased with two floors and the Kensington Church Street building nearest the corner building was increased with one floor, in order to provide more affordable housing on site. 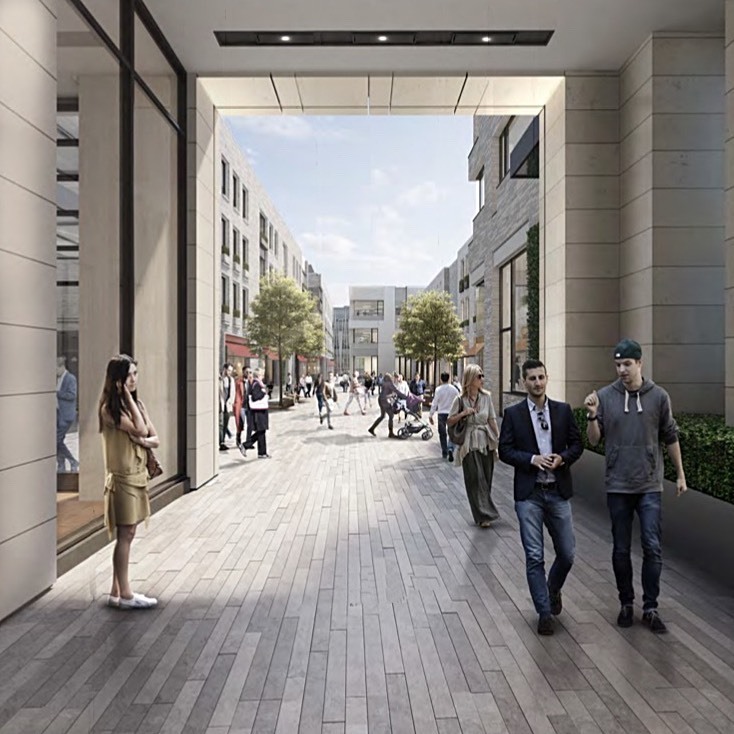 One of the five entrances to the public square will be a passageway linking it to Notting Hill Gate through the central tower. It will probably be a popular shortcut between Notting Hill Gate station and areas south of Kensington Mall.